In this weeks article, physio Tess is talking about injuries to the Achilles tendon. This is another common running injury we often see in our clinic, that when properly diagnosed and managed can be easily treated. Unfortunately many people ignore the niggle for so long that it then becomes a far more long-term injury, requiring longer periods of rest. 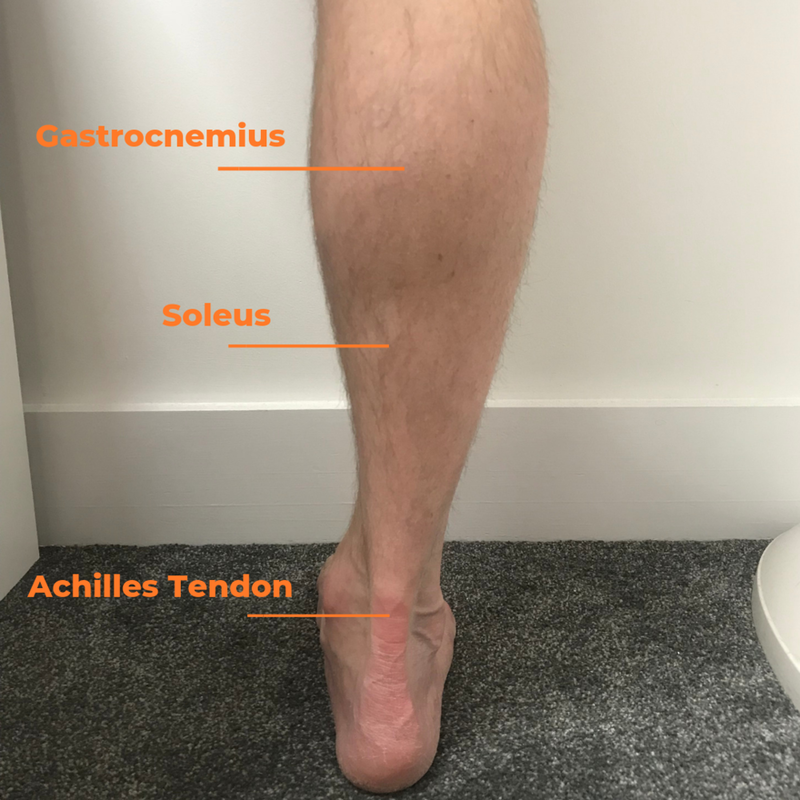 Achilles location: the Achilles tendon in located at the back of the lower leg and attaches the calf complex to the heel. Function: The function of the Achilles, like all tendons is to transmit force, in this case between the contracting muscle into the bone of the heel to perform the toes pointing movement (plantarflexion as shown below). Importance for runners: Every stride we run, this muscle action helps propel us forwards and gives us a spring/recoil like motion. The calf and achilles complex takes on all our body weight so needs to be really strong and resilient. Injuries: The most common injury we see is called a tendinopathy. This can occur in three different locations in the tendon. 1. Where the tendon meets the muscle, known as the musculotendinous junction. 2. In the middle of the tendon which is the most common location. 3. At the insertion into the heel. It is important to differentiate where the injury is located as this will change the treatment used and how we rehabilitate and train the tissues. (It has been suggested that the tendon can move up and down this continuum depending on treatment and recovery) - Cook and Purdum. Reactive tendinopathy can come about from the tendon responding to a rapid increase in load. i.e, large increase in mileage, or a change in training type. It can also result from a direct trauma to the tendon. The tendon can sometimes appear swollen or ‘inflamed’ due to increased water into the tendon but this is not an inflammatory process. It is often a short term response which can be reversible. Tendon disrepair is the stage that follows reactive tendinopathy if the tendon continues to be excessively loaded. It is similar to the reactive stage but the tendon structure begins to change. Degenerative tendinopathy is more common in the older athlete. It represents a response of the tendon to chronic overloading. There are multiple tendon structure changes making it less efficient at dealing with load. The tendon can appear thickened and nodular and there is risk of tendon rupture with advanced degeneration. Irrespective of the location of this type of tendinopathy the first step is load management. This means reducing both tensile and compressive load on the tendon which we achieve by lowering the training stimulus to a level that allows the tendon to recover. This phase of a tendinopathy does not respond well to compression. This occurs when the tendon is compressed against the bone during a specific movement known as dorsiflexion (toes pulled up as in image above/to the right). A common treatment for Achilles tendinopathy is eccentric loading off a step or stretching the calf which puts the foot into dorsiflexion. This means if you apply these during this phase, you will actually irritate the tendon more, prolonging the injury. Management includes: This may mean rest from running or modifying training depending on the severity of tendinopathy. Also, a heel raise in the shoes could be applied to reduce compression. Isometric exercises: Isometric exercise is where the muscle works against resistance without creating joint movement or changing muscle length - think of a static hold in a contracted position (avoiding dorsiflexion where the tendon is compressed). Strength exercises: calf raises performed from the floor (not off step); calf raise static holds; tip toe walks. Treatment for these phases are also load management and strengthening. As these are seen more in the older athlete or in younger runners with a history of chronically overloading the tendon, they are often harder to treat and take longer to improve. Typically a chronic tendinopathy can take up to six months to resolve, sometimes longer. If alongside this you’ve suddenly had an increase in pain due to increased mileage, you could also be experiencing reactive tendinopathy alongside a more chronic degenerative one. In which case you need to manage the reactive tendinopathy before addressing the more underling chronic injury. For your more chronic tendon a mixture of load management, eccentric exercises, isometrics and strength exercises are likely to help. Strength, power and endurance work will play a role, but identifying any biomechanical or footwear issues that may place additional load on a problem tendon is also crucial for recovery. These may need to be addressed to prevent a relapse with increased mileage. Some of the changes within the tendon may be reversible but it is likely this is a condition that will need to be managed in the long term. Management includes: This usually means a rest from running and modifying training. A biomechanical assessment would be beneficial and you may need an insert or a heel raise in your shoes to reduce compression. Eccentric exercises: Eccentric exercise is where the muscle works while increasing length and controlling joint motion - think of a slow lowering from tip toes down to the floor or off a step (avoiding dorsiflexion where the tendon is compressed if necessary). Strength exercises: lowering calf raises performed from the floor or off step; calf raise static holds; tip toe walks. It is also important to note that if the tendon injury is located at the insertion of the heel then these will not respond to eccentric exercise due to the compressive load and can potentially make it worse. In this case heavy isometrics and other loaded exercises need to be used. General strength work: Like with the management of any injury, integrated strength work will help prevent the recurrence and correct postural issues that in many cases lead to a tissue becoming overloaded in the first place. Simple trunk and lower body strength work such as side step ups, planks and side planks should feature alongside your rehabilitation. The further you get from pain and closer to running again, you should begin to re-introduce some low level plyometric exercises such as toe taps and later, pogo hops. You need to teach the tendon to behave like a tendon again! The return to running will be based on a gradual increase in mileage or training intensity – in order to allow the tendon to adapt to load. Changes to training need to be done gradually while monitoring symptoms. Change one variable at a time and plan enough rest after! If this is an injury you’re currently suffering from and you’d like some professional help, feel free to get in touch to book an appointment. Older PostStaying Active Through The Christmas Chaos!